The cruise industry is rapidly evolving to integrate the Internet of Things — with sensors, connected devices, artificial intelligence, and cloud computing — into the experience passengers will have, both on and off the mammoth, state-of-the-art, billion-dollar ships. It’s created a veritable wearable wars that spans companies like Carnival, MSC, and Royal Caribbean, which have all implemented new technology to change the way guests interact while onboard. The initial wave in this sea change of tech can actually be traced to the indoor water park company, Great Wolf Lodge, which debuted RFID-based smart wristbands that provide visitors electronic access control and cashless payments to its resort and waterpark guests, in 2005. The technology has made its way through various parts of hospitality and travel, from theme parks to hotels, and now, cruise companies see it as one key in offering personalized service to the thousands of passengers onboard and more efficient operations for their staff. But it was the land-locked city of Orlando, Florida, home to the Walt Disney World Resort, that’s had the biggest impact on what’s currently happening at sea. In 2013, Disney unveiled the MagicBand, a wearable device that uses radio-frequency identification (RFID), Bluetooth Low Energy (BLE), and near-field communication (NFC) technologies to connect guests’ park tickets, hotel room keys, payments, and PhotoPass information — providing access to resort rooms, merchandise payment, theme parks, rides, and attractions. John Padgett, who’s currently chief experience and innovation officer for Carnival Corporation (the world’s largest cruise operator), was the mastermind behind the MagicBand while working 18 years at Disney Parks and Resorts. He told Digital Trends that technology was forward-thinking from its inception, which was in tandem with the launch of the original iPhone. In fact, the MagicBand was a wearable before wearables were a thing. Anyone who hasn’t worn the waterproof MagicBand hasn’t really experienced the simplicity of a connected vacation. Available to every guest who stays at a Disney World resort (over 30 million have been distributed as of April 2017), the band does away with the need for credit cards, room keys, passes, park tickets, dining reservations, meal vouchers, and transportation tickets. Everything is stored on the MagicBand, which connects to the MyDisneyExperience app and website for a frictionless experience. The MagicBand was developed as a platform to support new experiences in the years to come, as evidenced by the early 2017 release of MagicBand 2, which unlocks additional in-park interactivity like seeing your name appear in “It’s a Small World,” or unlocking audio and video cues to play “A Pirate’s Adventure” in Adventureland. In May 2017, Universal Orlando Resort entered the wearable environment at its new water park, Volcano Bay. The wristband, called TapuTapu, uses a combination of radio frequency, Bluetooth, and NFC technologies to function as a credit card, ticket, hotel room key, and automated tagging of park photos. 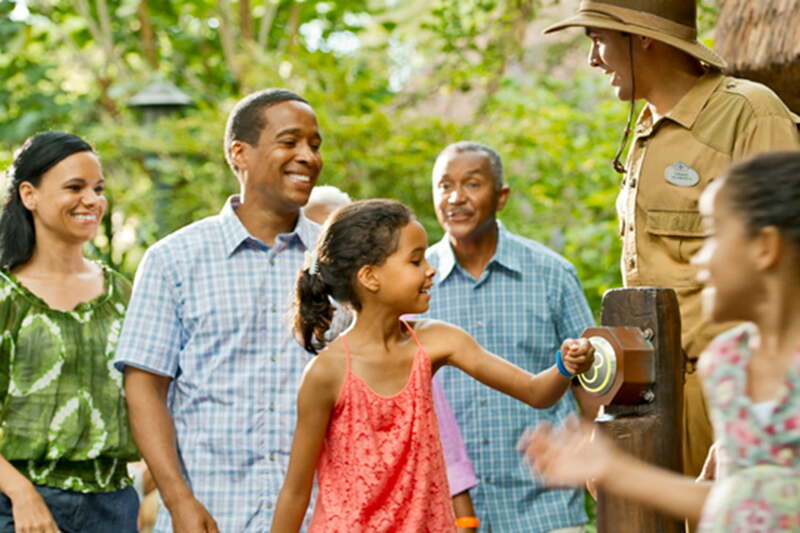 The technology also does away with ride queues completely, allowing guests to select which attractions they want to ride and wait for notifications while catching some rays or eating at one of the restaurants. But unlike Disney’s innovation, it hasn’t been implemented across the entire Universal Orlando Resort. When Padgett moved on to Carnival, in 2014, he enlisted former Disney MagicBand colleagues Jason Moffitt and Rich Criado to help develop a new project that would become the technology backbone of the company’s Medallion Class ships. Another MagicBand alum, Joey Hasty, moved on to Royal Caribbean, which recently unveiled a suite of new ship-board technology systems, called Excalibur. With the experience and knowledge they culled from their days at Disney, these individuals are now changing the dynamic of the cruise vacation. Princess Cruises is the first of Carnival’s 11 brands to embrace the Ocean Medallion, a 1.8-ounce device that interacts with the ship, allowing passengers to interact with food and beverage, retail, entertainment, lodging, recreation, and excursions seamlessly – without ever taking it out of their pocket, off their necklace, or swiping a band. (The Medallion can be tossed in a pocket or purse, or worn in a variety of cases, like a necklace or band). Padgett said the wearable leverages a first-of-its-kind “experience platform,” embedded with NFC, BLE, and other telemetry-producing sensors — in the context of a “smart ship” with an orchestrated multi-sensor experience ecosystem. The Ocean Medallion “the most extensive experiential Internet of Things that’s ever been done,” Padgett said. Beyond the ability to open and lock doors, order drinks, make dining or entertainment reservations, or purchase excursions, the Ocean Medallion ecosystem embraces artificial intelligence that tracks and learns about the guest with every interaction. Padgett said this AI evolves in real-time, multiple times per second, to offer suggestions for guests based on where they are on the ship, time of day, and what activities are occurring at that time. The Ocean Medallion gives guests the option of connecting to other Carnival technologies, including Ocean Ready (to answer health questions, scan passports, and go paper free), Play Ocean (a suite of mobile video games that can be played on or off the ship), and Ocean Compass (a schedule of on-board activities as well as a custom virtual sea avatar that appears across the ship). The Regal Princess is the first of multiple Princess ships that will launch over the coming years featuring this technology. And Padgett said the hope is that additional Carnival brands like Carnival Cruise Line, Holland America Line, and Cunard adopt this technology in the future. In 2014, Royal Caribbean Cruises Limited (RCL) debuted the Wow Band, using the same RFID technology Great Wolf Lodge had leveraged for almost a decade. These bands provide stateroom access and the purchase of onboard food, beverages, and merchandise. Beginning this fall, the company’s Royal Caribbean International, Celebrity Cruises, and Azamara Club Cruises brands are rolling out a new connected experience dubbed Excalibur, which integrates the Sea Beyond mobile app, the Wow Bands, and augmented and virtual reality. Joey Hasty, head of innovation and transformation at Royal Caribbean International, told Digital Trends the company is refocusing its efforts squarely at smartphones because it’s the one device passengers never forget, even while on vacation. Royal Caribbean Cruises’ app comes with a virtual concierge, built on artificial intelligence. Jay Schneider, senior vice president of Digital at RCL, told Digital Trends that people want their technology integrated, and the ubiquity of Android and Apple smartphones allows the company to have technology available to anyone at anytime, so they can use it as they want. Sea Beyond comes with a virtual concierge, built on artificial intelligence that helps customers to prioritize activity choices that are more interesting to them, according to Schneider. RCL has developed its systems to be open source, allowing the company to leverage the capabilities of smartphones as they advance every year. Hasty pointed to the new Face ID feature of the iPhone X as a security technology that could pave the way for other things in the future. “We’re excited about how that could lead to more capabilities and further reduce friction in the vacation experience,” Hasty said. RCL already is developing technology that uses facial recognition at the terminal to streamline the embarkation process, making it as seamless as ordering fries. The company recently showcased Excalibur at an event in New York City, where Digital Trends was able to experience some of the aforementioned technologies. Hasty said RCL is combining technologies ranging from facial recognition and RFID tagging to GPS mapping to Bluetooth-enabled beacons in an effort to streamline boarding, manage check-ins automatically, and improve wayfinding. But the tech goes beyond providing passenger comfort; it helps each ship and its crew to operate more efficiently. For example, if there were passengers unaccounted for, it could use location tracking to find missing guests. This can help with keeping the ship on schedule and monitoring the safety and security of passengers. RCL is also implementing augmented reality aboard its ships in the form of video games that come to life through boardwalk posters, when viewed through a smartphone. The company is using both ARKit and ARCore to make better use of ship space. Hasty said this could allow a section of the ship to transform from a family-friendly area during the day, into something different at night. These games will reward players with digital badges in the app, encouraging families to play together. Another AR implementation: Giving guests a behind-the-scenes look of areas that are normally off limits, such as galleys or the bridge. This allows passengers to engage with ship personnel without compromising security and safety. Virtual reality is also part of the excursion desk experience, thanks to a series of 360-degree videos created by Jaunt VR that gives guests a realistic preview of what to expect when they purchase an activity at ports of call. VR could also change the way future guests eat: At the NYC unveil, RCL took attendees through an experimental HTC Vive VR dining experience that combined food with virtual themed environments for a multi-sensory experience. Schneider said he’d like this concept to be turned into an actual restaurant at sea. Hasty said the Sea Beyond app will expand with additional features next year, including an opt-in to allow the app’s artificial intelligence to search public information, like local school calendars to recommend some of the best times to book a cruise vacation. The app will also sync with availability on RCL ships. Down the line, Hasty can see the ability for a guest to sync the Sea Beyond app with their personal calendar to reserve dates for a potential cruise. MSC Cruises is relatively new to the cutting-edge technology game. The cruise line has launched the MSC for Me digital innovation program. This program debuted this past June on the MSC Meraviglia, which was outfitted with 16,000 points of connectivity, 700 digital access points, 114 interactive screens, and 2,244 staterooms equipped with RFID and NFC technology. The MSC Seaside will be the second ship to offer this upgrade when it sets sail on Dec. 21, 2017. Luca Pronzati, chief digital innovation officer at MSC Cruises, told Digital Trends the goal is for a fleet-wide rollout of the program to the 10 upcoming “next generation megaships,” as well as its 12 existing ships. “We started this project three years ago and have worked with the world’s leading digital, tech, and behavioral science experts, including Samsung, HP and Deloitte,” Pronzati explained. The goal for the company wasn’t to lure millennials aboard, but to cater to the families that flock to its ships during the summer months. MSC is offering multiple ways for its passengers to tap into this new program. With NFC-based interactive bracelets, guests can access their staterooms; make payments onboard; load accurate location of children and family members throughout the ship; and book services, restaurants, excursions, and more in real time. Pronzati said the technology also allows for tailor-made service, since many of the 1,200 onboard video cameras can recognize individual guests with facial recognition and share personalized recommendations based on their preferences. Augmented reality is being employed to promote the 10 ships that are under construction, allowing guests to get an early look at these floating cities before they set sail. And Pronzati said virtual reality is also being explored for future ship experiences. All of these cruise lines, and many others not included in this story, are betting on a larger audience seeking vacation experiences. Royal Caribbean Cruises found in a recent survey that everyone, from millennials to baby boomers, are willing to pay more for experiences than physical goods. These floating cities that are being built around the world to sail the seven seas, are being designed from the ground-up to make the most of existing technology, with a forward-looking approach to what’s next. The goals are obvious: using technology to make cruising a more personalized, frictionless experience, and giving crews the ability to achieve that. All in the hopes of making cruising a mainstay for annual vacations.